Below is a description the Guadalupe Haus please contact us regarding specials. We accept all major credit cards. No cash or personal checks accepted. patio's and fire pit, 3 covered porches. Full kitchen, 2 living areas, fireplace. All the comforts of home located just down the lane from two sister properties the Cabana Guadalupe and Casa Grande Guadelupe sitting in a park like setting with 5 bedrooms, sleeps 18, 4.5 baths, 3 living areas, 2 river front patio's and fire pit. Renter supplies own linens and towels. We supply all the rest fully equipped kitchen (down to muffin tins and cake pans), two full size refrigerators, and microwave. Telephone, BBQ pit with smoker, cable t.v. (70+ channels), vcr. Full size washer and dryer. No smoking in any unit and pets are not welcome. I'm a globetrotter by nature and have been very fortunate to call many places home. The German hospitality concept of the Zimmerhaus (renting a room) is a fun way to meet people and get to know an area. The bed and breakfast stay is nice, however renting the entire house out is by far a better fit for larger groups. Since 2004 I've been excited to be able share my little piece of the beautiful Guadalupe River with so many. When you come to stay at the Guadalupe Haus you feel at home. It may not be the Ritz, but they don't have the private Guadalupe River front we do. You don't share the deck, fire fit or private water front entrance, when you rent it, if there's a crowd they came with you. 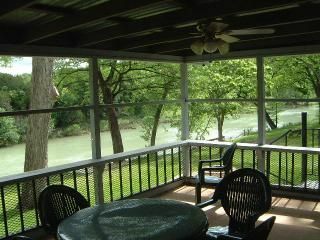 Heart of the Tubing and Rainbow Trout fishing on the Guadalupe River, launch your tubes/canoe's from your private pier. or rent all from Outfitter just up the lane. Three covered porches 2 overlooking the river, Firepit, 2 patios at rivers edge. Renter supplies own linens & towels. This is a great house that is on a perfect spot. This house couldn't be on a better river location. It has a huge back yard that leads right up to the river. Perfect spot for a big group. House is great too with a nice kitchen and plenty of places to sleep. We had a wonderful time at the property. It was clean and described correctly by the owner. The location was great being right on the river. We woke up early some mornings and saw otters swimming down the river. The owner was very responsive. We really enjoyed our time there and would go back again. Thanks! There are many pros and cons about this home. Let's start with the pros. *located directly on the river *nice back yard with 2 tables and a bonfire area *easy access to the river with the deck and steps. However, the deck is still under construction with sand bags in place. *many rooms and beds. The cons are more than it's worth renting. *dirty & dusty. *many bugs. *toilet bowls were stained with circled rings. It didn't even work properly. There were notes written on the flush handles. It read to hold down the handle til all the content is emptied. There were other notes around the house. One of it read, "This is broken do not open." The shower curtains have stains or mildew on it. It can run out of hot water quick. There were rules and notes on the refrigerator. One stating that the refrigerator can take up to 48 hrs to work properly. Do not place more than 40 bottles of drinks. If maintenance is called, there will be a charge of $75. We are renting this place for only 48hrs so this is ridiculous. The owner clearly knows that this refrigerator is not up to date with its standards. We had to place many refrigerated items in another refrigerator downstairs that was working properly. The sliding doors definitely need replacements. *no handles on the sliding doors which made it difficult to open. We had to place our fingers through the holes to pull it open. It won't even slide smoothly. Not to mention, the sliding door downstairs would not lock. The bunk bed that I personally slept on squeaks when you move. You can feel the springs. Please don't forget to bring your towels, bed sheets, and pillow cases. It's not provided. It's the first time I have rented a place that doesn't provide these necessities. There were a few kayaks in the storage room connected to the house. It was opened and we did took advantage of them. However, we were charged $500 taken from our deposit. The owner said that we did not have permission to use them. Most of the rental properties usually lock these doors. I'm not sure why this door wasn't lock nor did it have signs to alert us. She said that we were "trespassing". This can be very controversial, and I can't make sense of it. Overall, we had a great time. Despite all the negative things, we were fortunate to rent this house within a few wks. Please review all the rules and regulations. There were many of them. This can cost you. However, some deposits are ment to keep. This deposit was kept due to noncompliance with check in/out instructions stating that all garbage is to be placed in dumpster provided and for these guest helping themselves to the owners kayaks in an outside storage closet. When the guest was notified of the loss of the deposit their response was they didn't know the large dumpster was for their use it had a sign on it stating private. The sign clearly marks this dumpster for the use of GuadalupeRentals Guest only. In all the years this house has been on the vacation rental market never has a guest helped themselves to the contents of the owners storage closet. This guest said they read thru their rental agreement after being notified of the loss and said it didn't say they couldn't use the kayaks. Well it also doesn’t imply they could. The check in/out instructions state what is supplied. This guest stated where they messed up was they left the boats out in the yard. oops! This rural river front house is on a septic system, all appliances are in working order, it is regularly treated for insects, sanitized and thoroughly cleaned after every renter vacates. It is walked the day of arrival to make sure the property is welcoming. Regardless of the Cons to counter the lost deposit it is a well maintained property. Over 200 guest have stayed at this house this season - this is the only deposit we have kept at this house in the last 2 years. We welcome all to come to the river ask that you respect the rules, have fun, be safe, and come back. Tube & Shuttle RENTAL 200 YDS UP RIVER. 15 minutes away Canyon Lake recreation area. 15 minutes to the Schlitterbahn, historic Gruene & New Braunfels. 30 minutes to San Marcos Outlet Malls, Texas State University and San Antonio or Austin.